You wear your heart on your sleeve, so why not your favorite book on your finger, or neck or wrist for that matter? British artist Jeremy Mays crafts his visually arresting rings, bracelets, and necklaces from the pages of dusty old tomes, each replete with its own personal history and significance. Diehard bibliophiles may grimace at the premeditated mutilation of many a fine volume, but you can't help but be impressed by the glossy, finely sculpted gem that is the end result. For artist (and landscape architect) Jeremy Mays, printing words on paper is only the inaugural manifestation of the author’s ideas and vision. 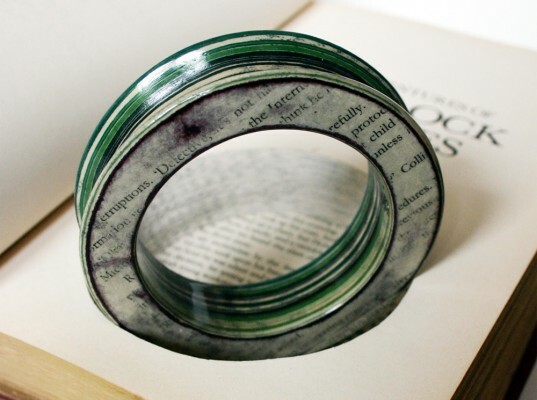 Once discarded and half-forgotten, a book can find new life as a gleaming ring, necklace, or bracelet. Through a process of layered compression and lacquering, Mays takes pages from a secondhand volume and sculpts them into a one-of-a-kind wearable. Mays takes pages from a secondhand volume and sculpts them into a one-of-a-kind wearable. Mays, who sources his vintage books from all over the globe, rifles through each work to find a distinct quote that will inspire the form of his final creation. Because each piece is so unique as to be impossible to replicate, Mays gives his literary baubles serial numbers. On the horizon is an eco-friendlier lacquer, which will result in rings that are as sustainable as they are beautiful. Prices start at £100 for a ring presented in a box but can cost as much as £1,500 for a more complex piece that is presented inside the book from which it was excavated. Although May's jewelry collection launched little more than a year ago, the trained landscape architect's pieces have found rapt audiences at Colette in Paris, Toi in Osaka, and the Eleni Marneri Creative Gallery in Athens. Carved directly from the pages of a secondhand book, each one-of-a-kind "literary jewel" undergoes a process of layered compression and lacquering that allows glimpses of the book's text and illustrations. To drive home the point of his jewelry's impossible-to-replicate nature, Mays supplies every piece with a unique serial number. Because each accessory is as distinct as the book it springs from, Mays chooses a quote from the volume to inspire his final creation. The first ring he ever made was a gift to his wife on their first—paper—anniversary. (His choice of material was her favorite Greek newspaper.) His second bore a sentiment from Cloister and the Hearth (1929) by novelist Charles Reade: "Not a day passes over the earth but men and women of no note do great deeds." Hundreds of pages are used to create May's pieces, each of which resembles carved wood. You can almost argue that Mays is playing the role of a translator, manifesting a text's original context and meaning in the third dimension. Using repurposed materials is naturally green, but Mays is currently experimenting with an eco-friendlier lacquer that will make the end result even more sustainable. Prices for May's jewelry start at £100 and go up to £1,500 depending on the complexity of the work and whether you want it packaged in the book from which it was cut. 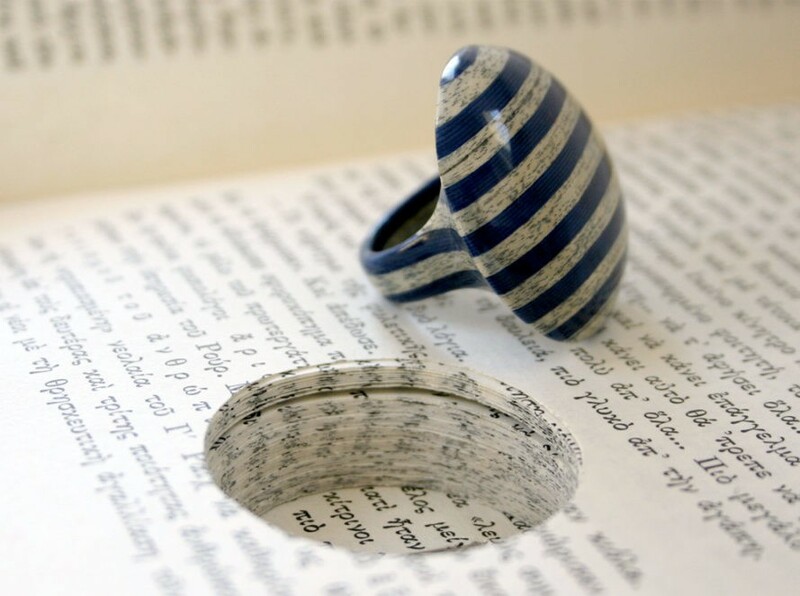 You can also commission him to turn a treasured book into a wearable heirloom. Just last week, a German couple hired Mays to create wedding bands using paper and white gold.